People in Britain consume on average 20 different food additives every day, with some eating up to 50, a study has suggested. Yet many people are unaware of this figure, with nearly half of the 1,006 people surveyed thinking they ate only 10 additives each day. The research also found that many people do not understand which foods are most likely to contain additives. The research was commissioned by food manufacturer Birds Eye. Consumers should learn how to read food labels so they know exactly what they are buying and eating. The survey found that people in Britain were more concerned about additives in their diet than about salt - but many underestimated the number of additives in their diets. The survey also revealed that many consumers do not understand where food additives lurk, with more than three quarters believing that cooking from scratch will help avoid them completely. However, the research found though that those who ate home cooked food ate an average of 19 additives over a 24 hour period - just one less than the average across the whole study. 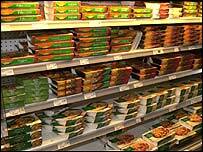 The survey also found that almost half of people believe frozen food contains more preservatives than chilled foods, when in fact the chilled ready meals consumed in the survey contained on average six times more preservatives than frozen ready meals. Nutritionist and Registered Dietician Jill Scott warned: "Consumers should learn how to read food labels so they know exactly what they are buying and eating." Food additives are substances intentionally added to food for a specific function, such as to alter the colour, texture of taste of foods, or to preserve them safely. Some reports have suggested that certain food additives can cause behavioural changes in some children, although many experts agree it is difficult to come to firm conclusions from the research carried out so far. Bridget Aisbitt, a nutrition scientist at the British Nutrition Foundation, said: "I understand that people don't like the idea of eating additives, but from a safety point of view there is no real problem [with eating them]." She said the levels of additives in all foods were tightly regulated so that the levels were kept very low, but to avoid them people should prepare their meals from fresh ingredients. "For salt we have evidence of a detrimental effect, as it seems to raise blood pressure, but I am not aware of any evidence that additives are the same." She also pointed out that additives are useful in food to keep food safe, for example by preventing mould from forming. The Food Standards Agency has recently funded a project to investigate whether artificial food additives do affect the behaviour of children.